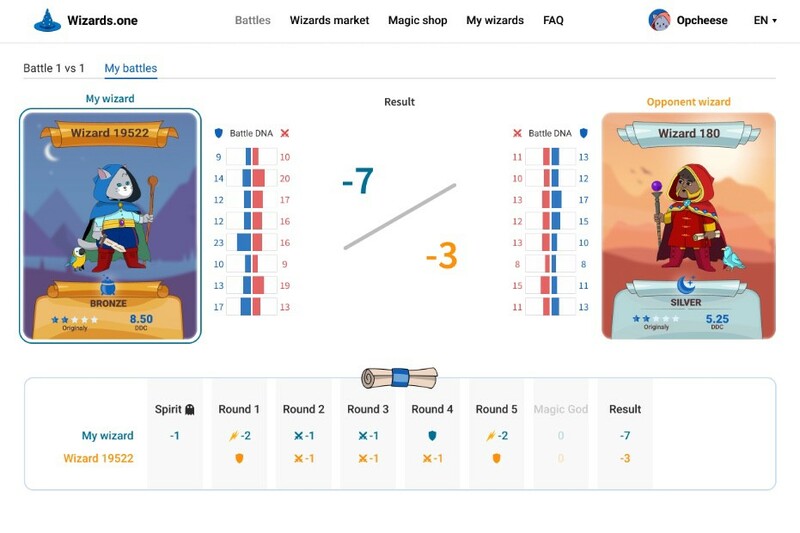 Andrey Durakov: Wizards.one is a game involving CryptoWizards, colorful digital characters that can be bought, collected, and auctioned. But ultimately they exist to fight each other and compete in tournaments for real and virtual prizes, including EOS tokens, and for honor. Each wizard has a unique Battle DNA, which affects their battle abilities; a Phenotype, which defines their race and visual appearance; and a distinct Outfit. Andrey Durakov: Last summer we started to work on LetItPlay, an “audio layer” for the internet. At the beginning of 2018, we chose EOS as a native blockchain for it. But the development of a new blockchain is full of surprises and adventures, so we decided to improve our skills on a smaller EOS app. It’s not a secret that CryptoWizards was inspired by CryptoKitties, which caused a huge clog in the Ethereum network due to the players’ activity for a few days in December 2017. It was very interesting to contrast the EOS and Ethereum networks; the expected performance of EOS is several orders of magnitude faster. Andrey Durakov: Our team, including myself, co-founder Grisha Klimov, and CTO Kirill Yurkov, have been working together for seven years. We’ve all taught Computer Science at Perm State National Research University for more than ten years. For years we’ve been hiring the best students to our company — in total, we have 25 people on the team, and 10 are working on Wizards, including developers, designers and project managers. We’re always experimenting with the best technology available — which is why we’re on EOS now. 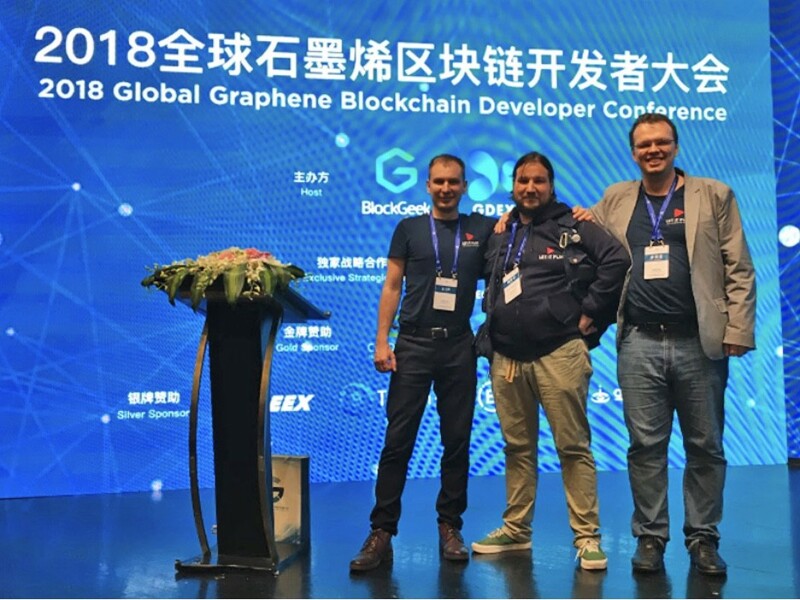 CEO Andrey Durakov, Petr Asalhanov from RuDEX, and CTO Kirill Yurkov are seen at the Global Graphene Developer Conference in Shanghai on May 4, 2018. Andrey Durakov: The game contains two parts: collectibles and battles. It was made for trading Wizards but it could be easily scaled for trading any other digital assets. The battles part of the game is huge, so we are going to launch it step by step. 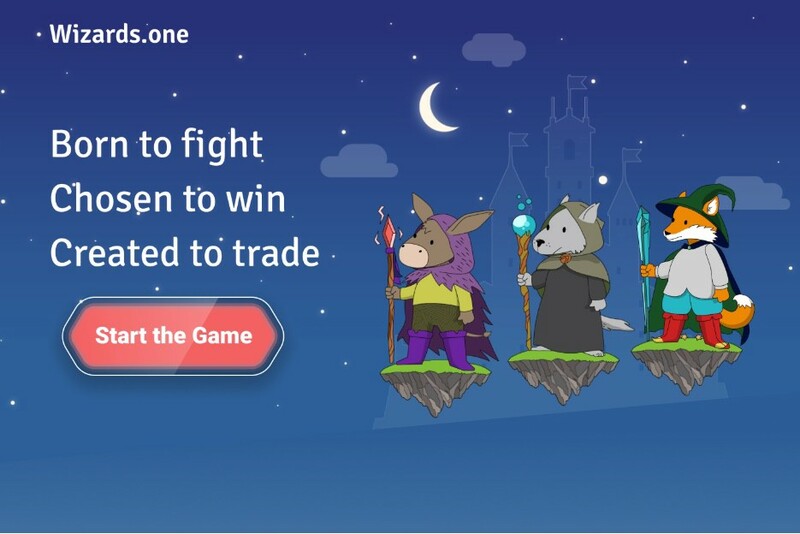 Firstly we will launch peer-vs-peer battles between wizards; after that will be massive tournaments where thousands of Wizards will fight each other for the tournament’s prizes and other special sponsor prizes. Ultimately we will create battle mechanics for squad battles and team battles. Andrey Durakov: The game has a lot of different mechanics which are implemented in smart contracts and this is the best guarantee that no one can cheat. Moreover, all the mechanics are open for review and anyone can check our open-source code. In terms of the collectibles part of the game, collectibles on a blockchain have much more value than in a centralized application because the ownership rights for any collectible item are reliably stored and do not depend on a third party outside the blockchain. As mentioned before, we were drawn to EOS because of its superior performance. Andrey Durakov: Initially the game was intended to be very simple but community feedback persuaded us to perfect it and make it much more complex. A lot of features and ideas came from the community and we’re so happy to have such strong support in stimulating us to make the game better. Actually the community has also created some tools for the game. For exampleCryptoBeings,made by Sven Pohl can be used to search Wizards and analyze their stats. We’d also like to give special thanks to the Scatter team and some of the block producers — including meet.one, oraclechain, onechain, eoscalgary, and blockchained — for their help with our airdrop.